Miya Shinma Sakura features notes of cherry blossom, white rose, rose, peony, cassis, lemon, cedar, and white musk. Sakura starts with cherry blossom, and lots of sparkling citrus — lemon, and possibly grapefruit or yuzu. It quickly fades to a very sweet and fruity rose scent, rather like rose jam with hints of berries and musk. It is pretty but I don't find it particularly interesting. I am very fond of Sakura tea, which is usually made by scenting Japanese sencha green tea with cherry blossoms. I was rather hoping this would capture that ethereal, spring-like scent, but it smells more like candy than cherry blossoms to me. Since Fragonard Cerisier en Fleurs did not work for me either, I would love to hear about any other cherry blossom fragrances worth trying. Has anyone tried any of the cherry blossom scents Guerlain has been producing for the Japanese market? Please comment! Miya Shinma Sakura is available in 10 and 50 ml Eau de Parfum. The lasting power is good. 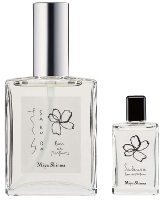 For buying information, see the listing for Miya Shinma under Perfume Houses. and NO sign of my pack! :((( Your customs are having a field day. Guerlain Cherry Blossoms produced for the Asian markets are very unremarkable, little amplitude and tenacity. I would not say that they are very close to sakura-cha, which I also really like. Drat customs! Still hoping it will show up. Thank you both. I figured as much, but it never hurts to ask. Do tell me which ones you've tried! I honestly don't even know of any other than the 2 I listed, and the Guerlains. I have tried two versions of the Guerlain perfumes: Cherry Blossom & Lovely Cherry Blossom. I was very excited to try them as they are not readily available (pretty bottles too). I was disappointed to find them both very boring: they seemed to be a mixture of light cherry & citrus. Not unpleasant at all, but not memorable or striking. Thanks so much for commenting, it looks like these are not worth the trouble of hunting down. Well, I've tried the NA (?) Guerlains, Lovely Cherry Blossom (frosted bottle) and Crazy(?) Cherry Blossom. I've also tried one with a peach bottle with a Japanese calligraphy-style branch that my friend from Hong Kong owned called (translated) Berries & Sweet Blossom, or something like that. As well, the cheap-o Miso Pretty type products. They all smell sweet and very heavily of alcohol to me. I don't get any “floral” scent at all. Is this possible? LOL at Crazy Cherry Blossom! I grew up in Washington DC, and we went to the Cherry Blossom festival every year, but I can't really remember what the flowers smelled like. Maybe it is such a delicate scent that it is buried in these very sweet perfumes? Real cherry blossoms don't really smell, so any cherry blossom fragrance would probably be created in much the same way gardenia being hard to extract is made with tuberose. I haven't smelled the Guerlain Cherry Blossom that was launched in Japan (with good reason–it is the Japanese national flower after all), I have eaten sakuramochi, which is beaten rice (mochi) with sweet red bean inside and a salty (pickled?) edible cherry blossom leaf wrapped around it. The taste of the leaf is tart. I must have eaten cherry blossoms too sometime in my life but I can't recall, which tells me that they couldn't have been especially tasty. S, that is interesting, I think someone else mentioned that they aren't scented. I wonder what they scent Sakura tea with then? It has a strong floral smell to me. Hmm…my guess is that the scent probably comes out when it is steeped in tea. There is definitely flavor and aroma to the leaf but it's delicate which is probably why it's easy to eat. I've not had sakura tea but I am curious to try it now. Which brand do you recommend? S, Mariage Freres has a nice one, Sakura Imperiale. They also put out a special edition one every spring that is supposed to be better, but I haven't ever managed to get my hands on it. I don't really know where to buy MF in NYC other than Bergdorfs though, and I've never seen the Sakura there. Ito En on Madison has a great selection of teas, but I can't remember if they have a Sakura.